For the past several weeks I have been running a live video podcast called Authored Content over Google+ Hangouts with my fellow lynda.com staff authors James Williamson and Ray Villalobos. This new platform and it’s direct connection to YouTube makes it easier than ever to record and publish conversations over webcam. The success and simplicity of Authored Content made me think: Could we use the same technology to broadcast and tape a WordPress Meetup talk? Yesterday I put that to the test, with mixed results. I’m sharing my experiences, experiments, and ideas about improvements with you so you can try this out for yourself. Feel free to pipe in with questions, comments, and suggestions so we can all share in the knowledge and make this work for everyone. One of the relatively new features of Google+ Hangouts is Hangouts On Air. This feature allows your Hangout to be a) broadcast live on your Google+ stream and on your YouTube channel page, and b) be recorded and published on YouTube for posterity. Getting Hangouts On Air to work requires a Google+ account, a YouTube account, and the interlinking of both. I’m not going to go through the process here. Suffice it to say it’s simple and takes about 10 minutes the first time you do it. Google+ Hangouts allows up to 10 participants, each of which can share their webcam, screen, or a specific window along with voice. So in a nutshell it’s Skype plus auto-publishing to YouTube. The reason I wanted to try Google+ Hangouts for this is because it would allow me to not only show a video of the speaker, but also potentially have the speaker share her screen on Hangouts so it could be displayed properly. This would circumvent the problem of screen capture which is horribly complicated under normal circumstances. Use one computer with a webcam and a microphone to record the speaker. This will be the main computer from which the Hangout is started. Have the speaker join the hangout with her computer and set it up to share the screen or window. Mute the microphone on the speaker computer so only one microphone is active. This setup would allow switching between a screen grab and the speaker and could also potentially be rigged up with more cameras (computers) to have multiple camera angles. Looks good in theory, right? We have accumulated a lot of professional audio and video gear over the years at Pink & Yellow Media and I spent quite a bit of time figuring out what would be the best setup. One of the major hurdles of Google+ Hangouts is that it only allows the use of webcams to display video (unless you rig something up to stream in a window and then share that window) so I couldn’t use any of my video cameras. I resorted to and old and surprisingly crappy LifeCam that has been kicking around but never used for years to experiment. Audio is also a challenge. Computer microphones are omnidirectional and crappy, so that was a non-starter. The microphone on the webcam is only minutely better. Instead I chose to test out the onboard microphones on my trusted Zoom H4n hooked up as an audio interface. The audio from this microphone is incredible and you can also control directionality quite well. Since this was an experiment I chose to forego the option of dragging my shotgun mic or wireless LAV with me, something I will do next time around. The results of the experiment were mixed. The first session recorded was Jill Binder’s CSS101 talk. We managed to get the screen sharing to work, but the H4n wouldn’t tether properly so as a result the audio was recorded through the aforementioned crappy LifeCam. You can see the result below. Verdict for this talk: Screen capture worked well, the webcam will live the remainder of its life on a landfill, and a better microphone is definitely necessary. I had a chance to reset for the 2nd session and got the H4n to tether properly. However, I encountered a new problem: Robert Dall, who was talking about Backgrounds, was using the Presenter Mode in PowerPoint to display his slides, and in the short time we had between sessions I was unable to get Hangouts to share this window (more on that in the Lessons Learned below). As a result only the video was shared, and as you can see from the video below, that is exactly the type of crappy illegible slides-on-a-wall video I do not want to share on the internet. Broadcasting and taping a WordPress Meetup with Google+ Hangouts works! A professional audio device is a must. A semi-directional mic like the one on the H4n works in a pinch, but ideally you want to couple it with a shotgun mic or a LAV or both. For the next meetup I am brining my Sennheiser G2 wireless kit for the presenter and my Audiotechnika shotgun to record audience questions. Because the H4n has two XLR inputs I can have both wired in and even switch between them. More experimentation needs to be done to figure out how to share presentations where the presenter is using Presenter View in PowerPoint and switching between screens. This is probably the most complicated part about the process and I have no immediate smart solutions. You have to use it as an audio interface like you say and then go to the settings in HOA and change the audio in/out to H4N. 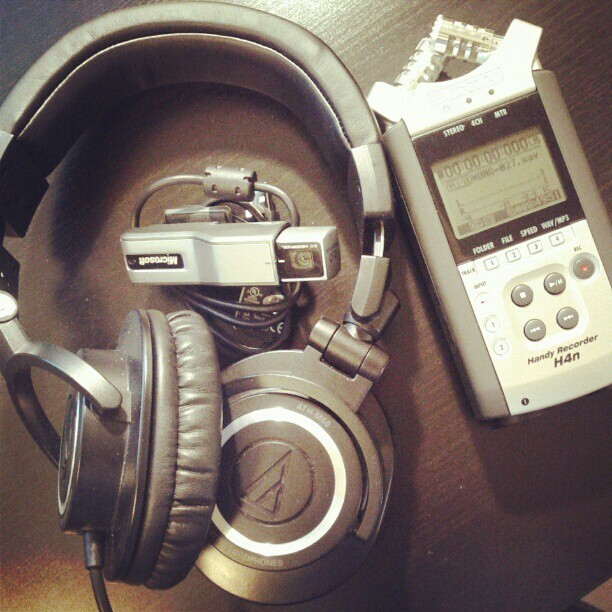 Sometimes you have to attach the H4N before booting up your browser to get it to recognize it as a valid audio source.